It was good example of cooperation between police, the California Department of Fish and Wildlife, researchers at UC Santa Cruz, and other agencies and organizations, said Chris Wilmers, associate professor of environmental studies at UCSC. 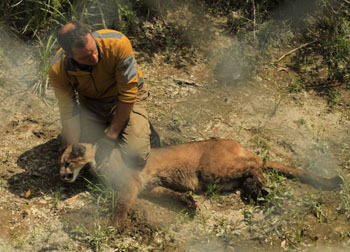 "It worked out well; it was a good way to handle the problem without having to shoot the animal," said Wilmers, who heads the UC Santa Cruz Puma Project that captures mountain lions in the Santa Cruz Mountains and releases them with collars that record and transmit their movements. Previous cases when police or game wardens shot and killed lions who wandered into residential areas prompted outcries and led to a new policy. Police and wildlife officials called Wilmers and his UCSC colleagues, along with Wildlife Emergency Services, a Moss Landing nonprofit, early Thursday morning after the young lion was discovered in a concrete aqueduct near a busy Santa Cruz intersection. The lion, clearly out of its element, had leapt into the aqueduct and was unable to get out. After discussing with wildlife officials and police on how to proceed, Wilmers shot the lion with two tranquilizing darts. Researchers needed to inject a third dose of tranquilizer by hand to ensure the lion was sedated, Wilmers said. "Fish and Wildlife are really in charge and we were assisting them," he said. Once unconscious, the 85-pound lion was loaded into a dog crate and hoisted from the aqueduct. Yiwei Wang, a UCSC environmental studies graduate student, and Paul Houghtaling, a wildlife biologist with the UCSC Puma Project, weighed and examined the lion, now dubbed 39M for the 39th lion captured in the research project. In a blog post, Wang said the young male is probably about 18 months old and recently separated from its mother. 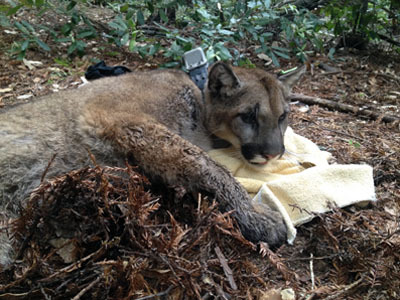 She and Houghtaling placed a new data-transmitting collar around its neck and released it into the Santa Cruz Mountains Thursday afternoon when two veterinarians said it was safe to do so. Wilmers said lions are released at nearby sites with good habitat and agreeable landowners. "Everyone worked well together," Wilmers said. "It was a nice cooperative effort between police, Fish and Wildlife and us." Wilmers' ongoing study monitors how human development that encroaches on lion habitat affects the animals' behavior. The study's first paper was published last month in the online journal PLOS One and documented three years of monitoring the behavior of 37 lions.